In his first West Coast public lecture in 10 years, Alexander will demonstrate that what he has been talking about for many years is feasible on a large scale. The methods for designing and building that are spelled out theoretically and practically applied in THE NATURE OF ORDER, TIMELESS WAY OF BUILDING, A PATTERN LANGUAGE, and other Center for Environmental Structure publications, are applied to the Eishin campus built near Tokyo, Japan from 1982 to 1985 - a project of 29 buildings on 20 acres of land, about nine city blocks. The care and finesse that Alexander has been describing to us throughout his career was applied to this large project, which came in on time and less expensively than a standard construction budget would have allowed. At the beginning of the talk, Alexander will show an extensive range of images about the project, the methods of construction that were used, the involvement of students and faculty, and the overall development of a full-scale environment of a rather lovely kind. Alexander will then talk on themes related to the way these buildings were made and are used and what it would mean if these principles could be applied to creating environments everywhere and society in general. What would that take? First is the recognition of what is described in BATTLE as system B - the method of production that is now prevalent throughout the world, which is centered on the profit motive, and supported by institutions and governments. 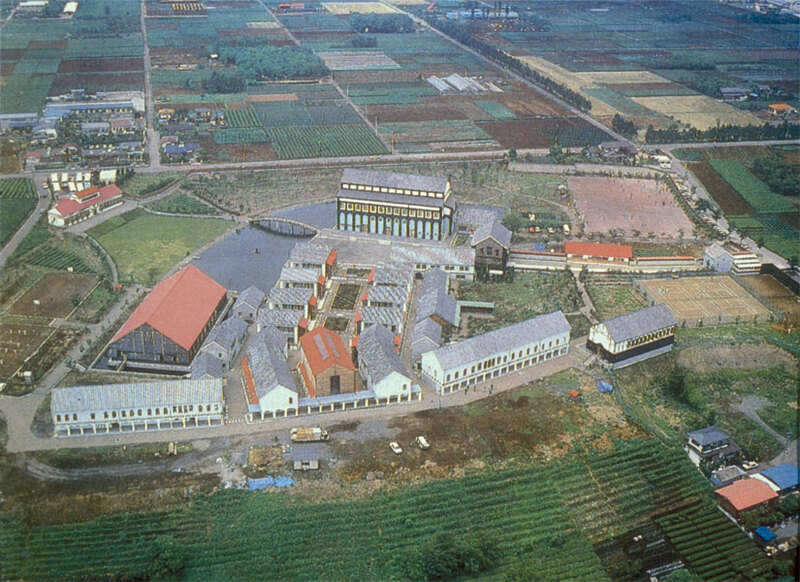 Then we need an understanding of system A, the system which built the Eishin campus, despite system B. It was a very rough road, with many painful, arduous, and sometimes seemingly hopeless battles. But along the way, Alexander and his colleagues learned that it could be possible for these two systems to become working partners, using the best of both to achieve something that is impossible now. The most important message of BATTLE is the vision of a way forward, that we could choose together, to build a society and an environment of such a kind that we would be fulfilled in living there. For nearly 40 years Christopher Alexander has challenged the architectural establishment, sometimes uncomfortably, to pay more attention to the human beings at the center of design. To do so he has combined top-flight scientific training, award-winning architectural research, patient observation and testing throughout his building projects, and a radical but profoundly influential set of ideas that have extended far beyond the realm of architecture. In the process Alexander has authored a series of groundbreaking works, including A Pattern Language: Towns, Buildings, Construction (Oxford University Press, 1977) and The Timeless Way of Building (OUP, 1977). His most recent publication continues that groundbreaking work, incorporating more than 30 years of research, study, teaching and building. The four-volume book set, The Nature of Order: An Essay on the Art of Building and the Nature of the Universe (Center for Environmental Structure, 2004) was described by Laura Miller of the New York Times "the kind of book every serious reader should wrestle with once in a while: [a] fat, challenging, grandiose tract that encourages you to take apart the way you think and put it back together again." Alexander was born in Vienna, Austria and raised in Oxford and Chichester, England. He was awarded the top open scholarship to Trinity College, Cambridge in 1954, in chemistry and physics, and went on to read mathematics at Cambridge. He took his doctorate in architecture at Harvard (the first Ph.D. in architecture ever awarded at Harvard), and was elected to the society of Fellows at Harvard University in 1961. During the same period he worked at MIT in transportation theory and in computer science, and at Harvard in cognitive science. His pioneering ideas from that time were known to be highly influential in those fields. In 1963, Alexander became Professor of Architecture at the University of California, Berkeley, and taught there continuously for 38 years, becoming Professor Emeritus in 2001. He also founded the Center for Environmental Structure, published hundreds of papers and several dozen books, and built more than 300 buildings around the world. In 2002 he moved back to England, where he now lives and works. Alexander is widely recognized as the father of the pattern language movement in computer science, which has led to important innovations such as Wiki, and new kinds of Object-Oriented Programming. He is the recipient of the first medal for research ever given by the American Institute of Architects, and he has been honored repeatedly for his buildings in many parts of the world. He was elected Fellow of the American Academy of Arts and Sciences in 1996 for his contributions to architecture, including his groundbreaking work on how the built environment affects the lives of people.